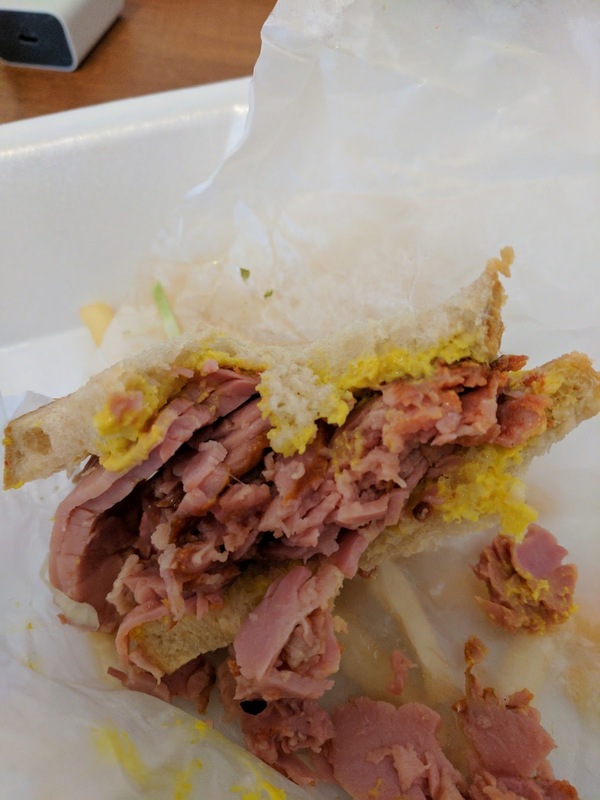 Guest blogger Josh Dennis shares about his experience with a very good smoked meat sandwich in Quebec. Thin bread relative to meat. The only meal that I truly wanted to try before leaving Montreal was the world famous smoked meat sandwich (further known as Sandwich). It is arguably the most famous food product originating Montreal sans poutine. The area in which I am staying contains what appears to be an endless number of eateries. There are countless options of styles from BBQ and Chinese Buffett to Italian and Mexican with all sorts in between. I was on a mission for the Sandwich today though. The closest such deli was Reuben’s, which happens to be one of the most renowned locales for such smoked meat. So let’s do this. The deli is located below street level down a wide set of dark stained oak stairs. Upon entering the stairs and subsequently the deli I felt that this was a friendly location with a long history. It was an eloquent building showing age and worn wooden bench style booths. The ambiance was sophisticated, yet not presumptuous. Upon entering I was greeted with a pleasant, “Bonjour”. The hostess assured me I could grab a sandwich for take-away and recommended the special. Easy, done. "Going with my usual dealer’s choice approach the woman behind the meat counter chose medium." When I arrived at the counter to order I was offered three choices: lean, medium or fatty. Going with my usual dealer’s choice approach the woman behind the meat counter chose medium. In less than 5 minutes I had my fare and was on my way back to my culinary laboratory. Back in my shared dormitory room I carefully unpackaged what was to be my first Sandwich. I was a slightly more than excited. My first impression upon opening the to-go container was that the size of the sandwich was not in proportion to the number of french fries or price for that matter, $15.51 CAD. As I unwrapped the sandwich from its paper sheath the dark pink color and actual amount of meat piled up reassured me that this meal still had potential. 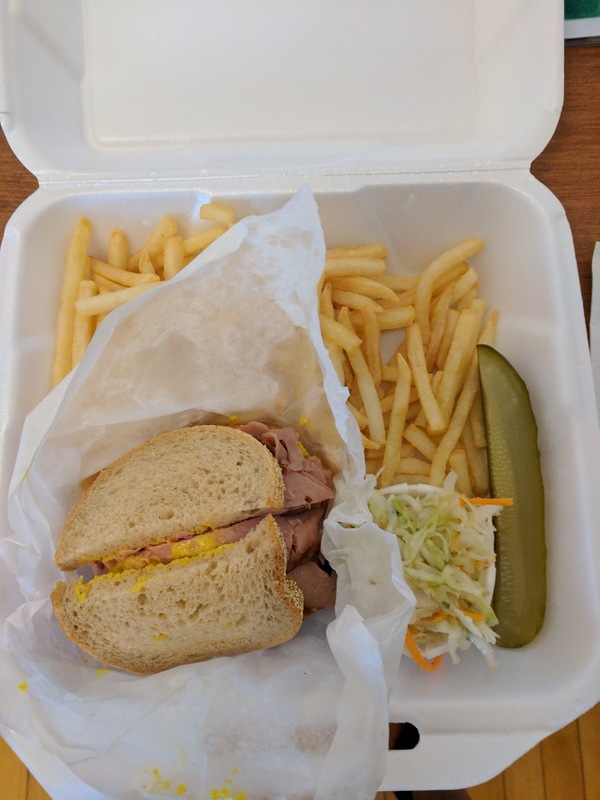 The package featured the sandwich, a small paper bowl filled with coleslaw, a generous portion of french fries and a pickle. "Every morsel of meat was so tender it would nearly melt in my mouth." I will start this ballad with the crescendo. The Sandwich was fantastic. The meat was extremely tender and full of amazing flavor. It was obviously smoked meat, however there was only a hint of smokiness. The flavor is difficult to describe as it didn’t have the characteristics of West Coast smoked meats that I am familiar with, ie: alder or applewood. It was very mild yet full of flavor. 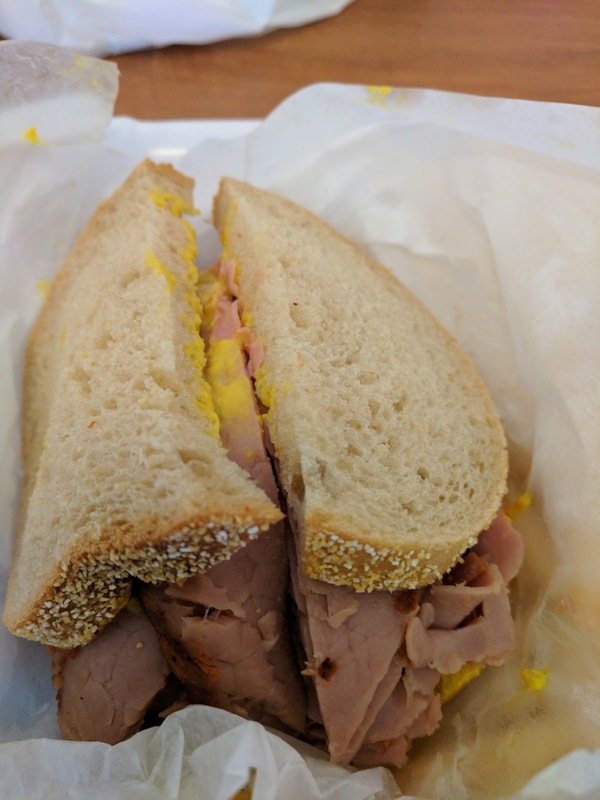 The closest deli meat I can compare it to would be a mild pastrami without the pepper or overwhelming spices. There was a dollop of yellow mustard which complimented the meat very well. Not once during the entire consumption process did I stumble into any grit, sinew or even one fatty bit. Every morsel of meat was so tender it would nearly melt in my mouth. The bread which contained the bulk of the Sandwich was a thinly sliced and light in color. First impressions told me that there was no way this thin bread would hold up against the smoked delight. In the end it held its own. The bread never become soggy or tore during consumption. It appeared to be a light rye bread, but like the meat it was very mild and melded well with the overall flavor profile. The coleslaw was also mild. Nothing outstanding about, however it was a solid slaw. Unlike many coleslaws it did not contain any creamy dressing. Instead it was dressed with a light vinegar based substance. There was a hint of apple cider vinegar and perhaps a slight fermentation. It was very difficult to be certain of the ingredients. The first couple of bites were confusing to my tastebuds. After the third or fourth bite I began to enjoy this nontraditional (at least to me) salad. Like most slaw it could have used some pepper, but I’m not complaining. "I used the recommended mayonnaise, ketchup combo as an esophageal lubricant..."
The only disappointment to this meal were the french fries. They were a very generic shoestring type fry. I would have expected something of a higher quality with this meal. Perhaps a skin-on or thick cut spud instead of this type which reminded me of a cheap fast food restaurant. I used the recommended mayonnaise, ketchup combo as an esophageal lubricant (both Kraft single server packets). This helped the overall experience, however it was still a disappointment. As per my modus operandi, I saved the pickle for last. It was a quarter pickle which had a rigidity to it. The kind you know will be crunchy from the time you pick it up. This last bit of fodder broke the mould of mildness. It had a bit of a spicy kick to it. Not overwhelming, just enough to let you know you were alive. Although it was obviously dill there was some other ingredients in the canning process. Like the slaw dressing it was difficult to pick(le) out the other mystery ingredients. It wasn’t top of the line but it was a solid pickle. I hadn’t eaten breakfast in preparation of my first Sandwich. After finishing the entire meal I was certainly satiated. The overall experience was pleasant and satisfying, yet slightly underwhelming. Reuben’s has a solid starting quarterback but the rest of the team is pretty mediocre. My recommendation would be to just order the sandwich and leave the rest to the other tourists.